Home > Automotive Belts > Automotive Serpentine Belts. 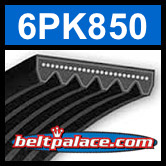 PK, K Section Poly V > 6PK850 Automotive Serpentine (Micro-V) Belt: 850mm x 6 ribs. 850mm Effective Length.